There are so many great things about Scratch: it teaches programming skills to kids, it’s fun and easy, and it’s free! Another fantastic feature is the Scratch online community. Students can browse completed projects, try tutorials, create interactive media, share, get feedback, learn from others, participate in discussion forums, and more! A bonus spinoff of this learning community is that students build essential digital citizenship skills as they interact with other Scratch programmers. Scratch can be used offline, but there are so many benefits to joining the creative online community of Scratchers! If you are interested in digital citizenship and coding, TechnoCode has programming lessons that are the perfect fit. Scratch has an extensive gallery of sample animations, games, interactive art, music, and stories. New users are encouraged to view them, look at the basic code, and modify them. The code often has tips that explain what it does. Suggestions are given for what can be changed: add sprites to a story, devise more obstacles for a game, or add sound effects. This is a great way for students to create their own unique project yet experience success early in their learning. The See Inside button allows you to view the programming of a project. You can see how someone else’s project works, figure out the blocks needed to create a specific effect, add part of a project to your backpack, or remix it and save it as a new project. Users new to Scratch can follow step-by-step, animated tutorials to make a project. Alternatively, download a set of illustrated, colorful activity cards and print them for easy to follow instructions. The motto of Scratch is Imagine, Program, Share. Budding programmers can learn by downloading and modifying the work of others. Check out how many remixes there are of a sample project in the gallery – sometimes there are over 100 different versions of the original! When it is uploaded, the remix of another creator’s project automatically gives credit to the original author and any others who contributed to it. Students are also encouraged to write something like “Based on […] by […]” Or “Thanks to […] for […]” In the Project Notes. Citing the source is an essential skill that students must master in any research work. Learning to acknowledge an author and avoiding plagiarism is a critical part of fostering sound digital citizenship. As young people learn to program, they learn to be innovative, build logical and computational thinking, and work collaboratively. These are all important life skills as well as fundamental competencies for the careers of the future. Using the Scratch online community, students share their work, ask for help, exchange ideas and projects, and collaborate. As students view the work of others, they can click a star to ‘favorite a project’, click a heart to ‘love a project’, or leave a comment. This support boosts the concept of a community of creators who are working together and who encourage one another. As students are building programming skills, Scratch can also help them to develop safe and responsible online practices. TechnoCode, is a Scratch project with activities that emphasize digital citizenship. 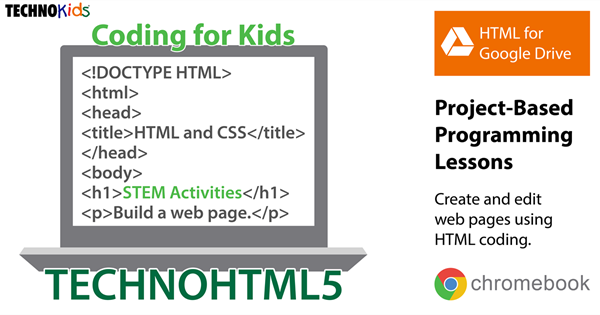 Lessons include instructions that guide students to share Scratch projects appropriately. Teach how to give credit to peers when remixing, cite the source of external resources, and comment responsibly. Moreover, their are many collaborative learning opportunities. Teach digital citizenship by joining the Scratch community. Lessons in TechnoCode promote responsible behavior. Are you or your students giving a PowerPoint presentation using a projector? Do you have speaker notes on the slides to which you would like to refer? Presenter View is a great feature in PowerPoint 2016 that allows the audience to see only the slide on a large screen while the presenter can see the slide, speaker notes, navigation icons, and even pen and laser pointer tools on their computer screen. Few people are completely comfortable with speaking to a group. But having the tools to refer to notes, appear self-assured, and present a slide show competently will boost anyone’s confidence. Turn on Presenter View without being connected to a projector to test it. View slide 1 of a PowerPoint 2016 presentation. Click Slide Show in the taskbar. At the bottom of the screen, click Slide Show Options. If this does not work and you just see the slide, click Display Settings. Select Swap Presenter View and Slide Show. You will see the slide, the next slide that will appear (or next animation), speaker notes and a number of useful presenter tools. Presenter View is an enhanced version of viewing the slide show. You see much more than just the slides, and the extra tools are helpful in giving a professional, effective presentation. Navigation Buttons – Advance to the next slide or animation or go to the previous slide using the arrows. Speaker Notes – Refer to your notes as a reminder of what you wanted to say for the slide. 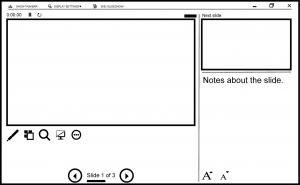 You can even change the font size of the notes while in Presenter View using the text tools at the bottom of the notes pane. Next Slide – See a preview of the next slide, or if you have animations to control the flow of information, see what will appear next. Tools – Direct the attention of the audience with a laser pointer, pen, or highlighter. You can change the pen color and erase as well. Zoom – Use the magnifying glass tool to zoom into a specific part of the slide to draw the attention of the audience to it. See All Slides – If there is a question period at the end or your presentation, or if you need to quickly go to another slide, use this tool to see a thumbnail of all slides. Timer – Track how long you have been presenting the slide show. If the presentation is on a time limit, refer to this useful tool to time the slide show. In my next post, I’ll list some of the benefits of using Presenter View with students to build public speaking skills and make their presentations engaging and compelling for their peers. Power up a presentation, teach essential research skills, and build public speaking techniques with TechnoPresenter technology project. 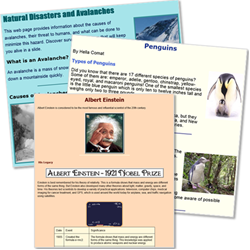 Integrate this project into an area of the curriculum using any topic of study. 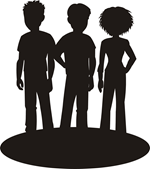 This project is suitable for student in junior and middle school grades. Learn more about TechnoPresenter here.